There can only ever be one winner and this time it was Neil McFayden’s turn to take top spot. Neil, 36, is usually kept busy at his 9 to 5 in finance but enjoys playing poker in his spare time. Neil has enjoyed some poker success over the years, predominately in the USA whilst visiting the WSOP in Las Vegas. Most notably a deep run in the 2010 WSOP Main event netted him over $40,000 but this latest win, coming 8 years later, far exceeds his previous best live poker result. As is the case with most GUKPT final tables, it was certainly no easy feat coming out on top. The top four in Luton also included UK hot shots Yiannis Liperis, Sam Goodman and Dave Clarkson, all of whom agreed on a deal four handed to spread the prize money more evenly. 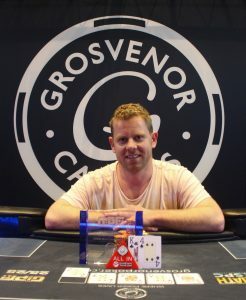 Ultimately Neil came up trumps to secure the trophy, with a pivotal hand where his pocket Ten’s held up against the 98 off suit of Sam Goodman giving him the chip advantage he needed to take him to victory.